After traveling down the country sampling France’s gastronomic delights I thought I better do some work: I turned up, stylishly early, at Hervé Mons Fromagerie near to Roanne. Nervously I waited, the smell of cheese drifting up my nose. I saw someone arrive so ran over to them calling out “Eric! Eric!” (the name of my contact with Mons). In a typically Gallic way he just looked at me said “Non, je ne suis pas Eric” and walked away and I sheepishly returned to my car. Five minutes later another car pulled up so again I ran over looking like a lost sheep bleating for its mother. “Eric?” I demanded. The man looked me up and down and said I can get you Eric, but I’m not him. I all of a sudden went off him, but helpfully enough he managed to get in contact with Eric and confirm he was on his away. As the man left I asked his name and he looked at me and said Hervé Mons. Oh great! Eric arrived a few moments later and was very helpful, showing me around their impressive cheese caves (I could feel my excitement brewing already) before taking me to my accommodation – a fantastic typically French house in the middle of the sleepy mediaeval village of St Haon le Chatel, where I have now become ‘the outsider’. So my apprenticeship commenced here. I turned up the next morning to be introduced to all my colleagues (whose names I promptly forgot in the excitement) and was directed to some cheeses I recognised . Tomme de Savoie, Crayeuse, Persille du Malzieu. “Flip and brush these,” my new boss instructed. Several cheesy hours later, I was done. So he gave me some more to flip and brush, if his French accent wasn’t so endearing I might have considered refusing, but I continued till the end of the day. Day two was a little more exciting, I started by learning a bit more about how to handle the cheeses when they arrive – where to put them, and how to treat each cheese individually – whether it needed drying, to get more moist, or firming up, and which of the four caves was best for it, as well as whether paper, spruce wood or straw would aid it’s development best. However, just to make sure I didn’t get above my station, they gave me a few more cheese to flip (I think that’s what I’m going to make my future children do if they’re ever naughty). At the end of the first week I was having a good time, although I’d flipped enough cheeses to keep a Frenchman happy for a few weeks at least. As well as learning a fair bit about their techniques here at Mons, my French language is also improving. 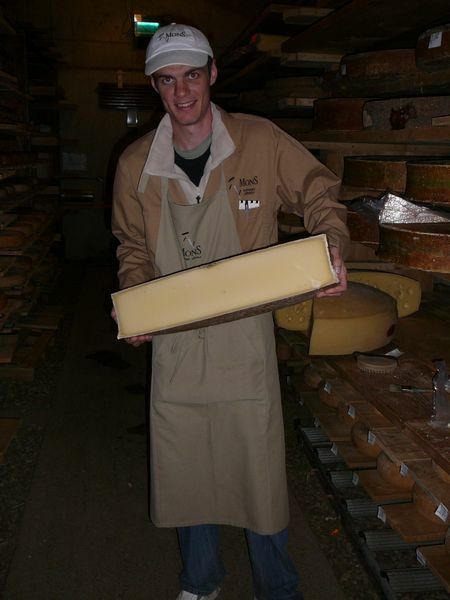 I also got to meet Hervé’s brother, Laurent: another talented individual whose passion seems to be cheese. It’s weird around these people… I don’t feel such a cheese geek. 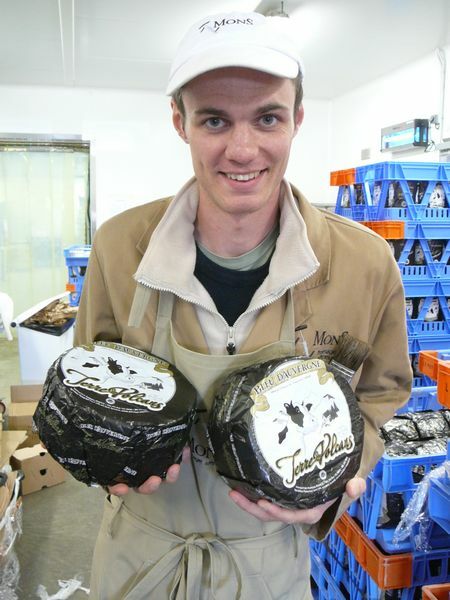 Week two was much more interesting – I thought I had become a master cheese flipper until I saw Fred, who’s worked all his life flipping the mountain cheeses (35kg+) as if they are made of air. Throughout the week I picked up lots of tips and tricks about affinage, best practice, and how to treat cheese differently and promote or stop bacteria growth, and I spent so much time wiping mould off a certain cheese that when I blew my nose, even my tissue got mouldy – there is a first time for everything! It helps that my foreman, Guillaume, is very useful. Although typically French (he almost went through the roof when he found out I still eat porridge everyday), he has a great sense for the cheese, knowing what they’re like and what to do in any case of any event; he is a mine of knowledge! I must try and smuggle him back to England. This third week I worked more on receiving the cheeses: they arrive everyday from hundreds of small producers throughout France, and each producer is individual, as is each cheese batch that arrives. 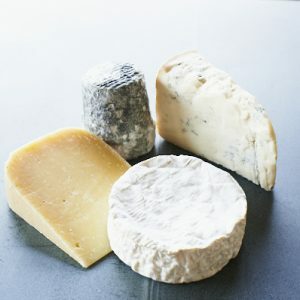 It can even be affected by the cheese producer nipping out for a brew whilst making the cheese – that could slightly alter the final make up which means we need to treat it differently to get the best out of it. So when each batch arrives it is checked over and then transferred to the appropriate ageing material and cave. 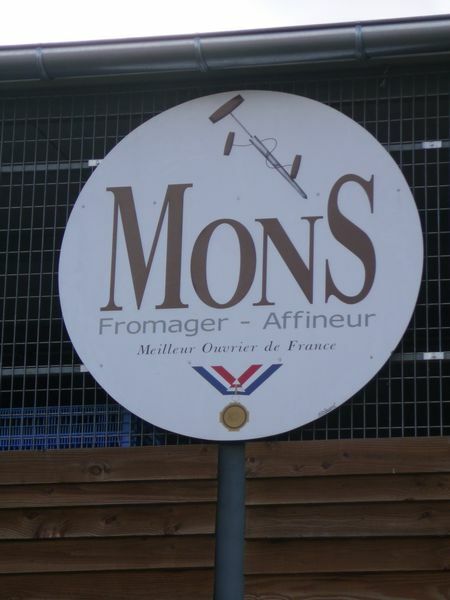 Read more about the caves in week two: The Cheese Caves at Mons Fromages and about Andy’s visit to one of the best cheesemakers he has ever met: Meet the producer: Salers de Buron Traditional, an ancient way of making cheese. 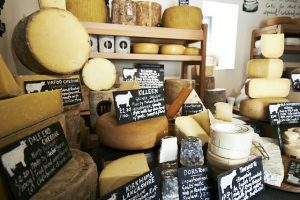 If you are looking for more information on ageing cheese or caring for cheese better in your own shop / ageing facility click here: How to look after, mature and age cheese: advice for shop owners. 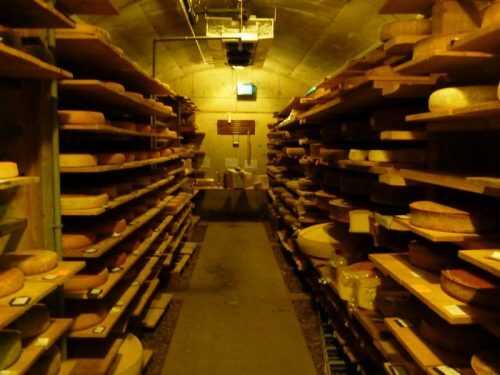 Cheese Ageing – how to mature and look after cheese.